Gateway Load Balancing Protocol (GLBP) protects data traffic from a failed router or circuit, like Hot Standby Router Protocol (HSRP) and Virtual Router Redundancy Protocol (VRRP), while allowing packet load sharing between a group of redundant routers. Before configuring the GLBP feature, ensure that the routers can support multiple MAC addresses on the physical interfaces. For each GLBP forwarder to be configured, an additional MAC address is used. The Gateway Load Balancing Protocol feature provides automatic router backup for IP hosts configured with a single default gateway on an IEEE 802.3 LAN. Multiple first hop routers on the LAN combine to offer a single virtual first hop IP router while sharing the IP packet forwarding load. Other routers on the LAN may act as redundant GLBP routers that will become active if any of the existing forwarding routers fail. GLBP performs a similar, but not identical, function for the user as the HSRP and the VRRP. HSRP and VRRP protocols allow multiple routers to participate in a virtual router group configured with a virtual IP address. One member is elected to be the active router to forward packets sent to the virtual IP address for the group. The other routers in the group are redundant until the active router fails. These standby routers have unused bandwidth that the protocol is not using. Although multiple virtual router groups can be configured for the same set of routers, the hosts must be configured for different default gateways, which results in an extra administrative burden. GLBP provides load balancing over multiple routers (gateways) using a single virtual IP address and multiple virtual MAC addresses. Each host is configured with the same virtual IP address, and all routers in the virtual router group participate in forwarding packets. GLBP members communicate between each other through hello messages sent every 3 seconds to the multicast address 224.0.0.102, User Datagram Protocol (UDP) port 3222 (source and destination). Members of a GLBP group elect one gateway to be the active virtual gateway (AVG) for that group. Other group members provide backup for the AVG in the event that the AVG becomes unavailable. The AVG assigns a virtual MAC address to each member of the GLBP group. Each gateway assumes responsibility for forwarding packets sent to the virtual MAC address assigned to it by the AVG. These gateways are known as active virtual forwarders (AVFs) for their virtual MAC address. The AVG is responsible for answering Address Resolution Protocol (ARP) requests for the virtual IP address. Load sharing is achieved by the AVG replying to the ARP requests with different virtual MAC addresses. In Figure 1, Router A is the AVG for a GLBP group, and is responsible for the virtual IP address 10.21.8.10. Router A is also an AVF for the virtual MAC address 0007.b400.0101. Router B is a member of the same GLBP group and is designated as the AVF for the virtual MAC address 0007.b400.0102. Client 1 has a default gateway IP address of 10.21.8.10 and a gateway MAC address of 0007.b400.0101. Client 2 shares the same default gateway IP address but receives the gateway MAC address 0007.b400.0102 because Router B is sharing the traffic load with Router A. If Router A becomes unavailable, Client 1 will not lose access to the WAN because Router B will assume responsibility for forwarding packets sent to the virtual MAC address of Router A, and for responding to packets sent to its own virtual MAC address. Router B will also assume the role of the AVG for the entire GLBP group. Communication for the GLBP members continues despite the failure of a router in the GLBP group. A GLBP group allows up to four virtual MAC addresses per group. The AVG is responsible for assigning the virtual MAC addresses to each member of the group. Other group members request a virtual MAC address after they discover the AVG through hello messages. Gateways are assigned the next MAC address in sequence. A virtual forwarder that is assigned a virtual MAC address by the AVG is known as a primary virtual forwarder. Other members of the GLBP group learn the virtual MAC addresses from hello messages. A virtual forwarder that has learned the virtual MAC address is referred to as a secondary virtual forwarder. GLBP operates virtual gateway redundancy in the same way as HSRP. One gateway is elected as the AVG, another gateway is elected as the standby virtual gateway, and the remaining gateways are placed in a listen state. If an AVG fails, the standby virtual gateway will assume responsibility for the virtual IP address. A new standby virtual gateway is then elected from the gateways in the listen state. Virtual forwarder redundancy is similar to virtual gateway redundancy with an AVF. If the AVF fails, one of the secondary virtual forwarders in the listen state assumes responsibility for the virtual MAC address. The new AVF is also a primary virtual forwarder for a different forwarder number. GLBP migrates hosts away from the old forwarder number using two timers that start as soon as the gateway changes to the active virtual forwarder state. GLBP uses the hello messages to communicate the current state of the timers. The redirect time is the interval during which the AVG continues to redirect hosts to the old virtual forwarder MAC address. When the redirect time expires, the AVG stops redirecting hosts to the virtual forwarder, although the virtual forwarder will continue to forward packets that were sent to the old virtual forwarder MAC address. The secondary holdtime is the interval during which the virtual forwarder is valid. When the secondary holdtime expires, the virtual forwarder is removed from all gateways in the GLBP group. The expired virtual forwarder number becomes eligible for reassignment by the AVG. GLBP gateway priority determines the role that each GLBP gateway plays and what happens if the AVG fails. Priority also determines if a GLBP router functions as a backup virtual gateway and the order of ascendancy to becoming an AVG if the current AVG fails. You can configure the priority of each backup virtual gateway with a value of 1 through 255 using the glbp priority command. In Figure 1, if Router A, the AVG in a LAN topology, fails, an election process takes place to determine which backup virtual gateway should take over. In this example, Router B is the only other member in the group so it will automatically become the new AVG. If another router existed in the same GLBP group with a higher priority, then the router with the highest priority would be elected. If both routers have the same priority, the backup virtual gateway with the higher IP address would be elected to become the active virtual gateway. By default, the GLBP gateway preemptive scheme is disabled. A backup virtual gateway can become the AVG only if the current AVG fails, regardless of the priorities assigned to the virtual gateways. You can enable the GLBP preemptive scheme using the glbp preempt command. Preemption allows a backup virtual gateway to become the AVG, if the backup virtual gateway is assigned a higher priority than the current AVG. GLBP uses a weighting scheme to determine the forwarding capacity of each router in the GLBP group. The weighting assigned to a router in the GLBP group determines whether it will forward packets and, if so, the proportion of hosts in the LAN for which it will forward packets. Thresholds can be set to disable forwarding when the weighting falls below a certain value, and when it rises above another threshold, forwarding is automatically reenabled. The GLBP group weighting can be automatically adjusted by tracking the state of an interface within the router. If a tracked interface goes down, the GLBP group weighting is reduced by a specified value. Different interfaces can be tracked to decrement the GLBP weighting by varying amounts. You can configure GLBP in such a way that traffic from LAN clients can be shared by multiple routers, thereby sharing the traffic load more equitably among available routers. GLBP supports up to 1024 virtual routers (GLBP groups) on each physical interface of a router, and up to 4 virtual forwarders per group. This task explains how to customize your GLBP configuration. Customizing the behavior of GLBP is optional. Be aware that as soon as you enable a GLBP group, that group is operating. It is possible that if you first enable a GLBP group before customizing GLBP, the router could take over control of the group and become the AVG before you have finished customizing the feature. Therefore, if you plan to customize GLBP, it is a good idea to do so before enabling GLBP. Specifies an interface type and number, and enters interface configuration mode. Specifies a primary or secondary IP address for an interface. • Refer to the "Configuring IP Addressing" chapter of the Release 12.2 Cisco IOS IP Configuration Guide for information on configuring IP addresses. Authenticates GLBP packets received from other routers in the group. • If you configure authentication, all routers within the GLBP group must use the same authentication string. Configures the router to take over as AVF for a GLBP group if it has a higher priority than the current AVF. • This command is enabled by default with a delay of 30 seconds. • Use the optional delay and minimum keywords and the seconds argument to specify a minimum delay interval in seconds before preemption of the AVF takes place. Specifies the method of load balancing used by the GLBP AVG. Configures the router to take over as AVG for a GLBP group if it has a higher priority than the current AVG. • This command is disabled by default. • Use the optional delay and minimum keywords and the seconds argument to specify a minimum delay interval in seconds before preemption of the AVG takes place. Sets the priority level of the gateway within a GLBP group. • The default value is 100. Configures the interval between successive hello packets sent by the AVG in a GLBP group. • The holdtime argument specifies the interval in seconds before the virtual gateway and virtual forwarder information in the hello packet is considered invalid. • The optional msec keyword specifies that the following argument will be expressed in milliseconds, instead of the default seconds. Configures the time interval during which the AVG continues to redirect clients to an AVF. • The timeout argument specifies the interval in seconds before a secondary virtual forwarder becomes invalid. Note	 The zero value for the redirect argument cannot be removed from the range of acceptable values because preexisting configurations of Cisco IOS software already using the zero value could be negatively affected during an upgrade. However, be advised that a zero setting is not recommended and, if used, results in a redirect timer that never expires. If the redirect timer does not expire, then when a router fails, new hosts continue to be assigned to the failed router instead of being redirected to the backup. Exits interface configuration mode, and returns the router to global configuration mode. If you do not need to configure GLBP weighting values and object tracking, proceed to the "Enabling and Verifying GLBP" section. This task explains how to configure GLBP weighting values and object tracking. GLBP weighting is used to determine whether a router can act as a virtual forwarder. Initial weighting values can be set and optional thresholds specified. Interface states can be tracked and a decrement value set to reduce the weighting value if the interface goes down. When the GLBP router weighting drops below a specified value, the router will no longer be an active virtual forwarder. When the weighting rises above a specified value, the router can resume its role as an active virtual forwarder. Configures an interface to be tracked where changes in the state of the interface affect the weighting of a GLBP gateway. • This command configures the interface and corresponding object number to be used with the glbp weighting track command. • The line-protocol keyword tracks whether the interface is up. The ip routing keywords also check that IP routing is enabled on the interface, and an IP address is configured. Specifies the initial weighting value, and the upper and lower thresholds, for a GLBP gateway. Specifies an object to be tracked that affects the weighting of a GLBP gateway. • The value argument specifies a reduction in the weighting of a GLBP gateway when a tracked object fails. This task explains how to enable GLBP on an interface and verify its configuration and operation. GLBP is designed to be easy to configure. Each gateway in a GLBP group must be configured with the same group number, and at least one gateway in the GLBP group must be configured with the virtual IP address to be used by the group. All other required parameters can be learned. If VLANs are in use on an interface, the GLBP group number must be different for each VLAN. Enables GLBP on an interface and identifies the primary IP address of the virtual gateway. • After you identify a primary IP address, you can use the glbp group ip command again with the secondary keyword to indicate additional IP addresses supported by this group. (Optional) Displays information about GLBP groups on a router. • Use the optional brief keyword to display a single line of information about each virtual gateway or virtual forwarder. The Gateway Load Balancing Protocol feature introduces five privileged EXEC mode commands to enable diagnostic output concerning various events relating to the operation of GLBP to be displayed on a console. The debug condition glbp, debug glbp errors, debug glbp events, debug glbp packets, and debug glbp terse commands are intended only for troubleshooting purposes because the volume of output generated by the software can result in severe performance degradation on the router. Perform this task to minimize the impact of using the debug glbp commands. This procedure will minimize the load on the router created by the debug condition glbp or debug glbp command because the console port is no longer generating character-by-character processor interrupts. If you cannot connect to a console directly, you can run this procedure via a terminal server. If you must break the Telnet connection, however, you may not be able to reconnect because the router may be unable to respond due to the processor load of generating the debugging output. This task requires a router running GLBP to be attached directly to a console. 4. Use Telnet to access a router port and repeat Steps 1 and 2. Disables all logging to the console terminal. • To reenable logging to the console, use the logging console command in global configuration mode. Use Telnet to access a router port and repeat Steps 1 and 2. Enters global configuration mode in a recursive Telnet session, which allows the output to be redirected away from the console port. Enables logging output on the virtual terminal. Displays debugging messages about GLBP conditions. • Try to enter only specific debug condition glbp or debug glbp commands to isolate the output to a certain subcomponent and minimize the load on the processor. Use appropriate arguments and keywords to generate more detailed debug information on specified subcomponents. • Enter the specific no debug condition glbp or no debug glbp command when you are finished. Disables logging on the virtual terminal. In the following example, Router A, shown in Figure 1, is configured to track the IP routing state of the POS interface 6/0, an initial GLBP weighting with upper and lower thresholds is set, and a weighting decrement value of 5 is set. If POS interface 6/0 goes down, the weighting value of the router is reduced. This section documents new commands. All other commands used with this feature are documented in the Cisco IOS Release 12.2 T command reference publications. To display debugging messages about Gateway Load Balancing Protocol (GLBP) conditions, use the debug condition glbp command in privileged EXEC mode. To disable debugging output, use the no form of this command. Interface type and number for which output is displayed. GLBP group number in the range from 0 to 1023. (Optional) Number in the range from 1 to 255 used to identify a virtual MAC address. Displays debugging messages about GLBP errors. Displays debugging messages about GLBP events. Displays debugging messages about GLBP packets. Displays a limited range of debugging messages about GLBP errors, events, and packets. To display debugging messages about Gateway Load Balancing Protocol (GLBP) error conditions, use the debug glbp errors command in privileged EXEC mode. To disable debugging output, use the no form of this command. Displays debugging messages about GLBP that match specific conditions. To display debugging messages about Gateway Load Balancing Protocol (GLBP) events that are occurring, use the debug glbp events command in privileged EXEC mode. To disable debugging output, use the no form of this command. (Optional) Displays all debugging output about GLBP events. (Optional) Displays detailed debugging output about GLBP events. (Optional) Displays a limited range of debugging output about GLBP events. To display summary information about Gateway Load Balancing Protocol (GLBP) packets being sent or received, use the debug glbp packets command in privileged EXEC mode. To disable debugging output, use the no form of this command. (Optional) Displays all debugging output about GLBP packets. (Optional) Displays detailed debugging output about GLBP packets. (Optional) Displays debugging output about GLBP hello packets. (Optional) Displays debugging output about GLBP reply packets. (Optional) Displays debugging output about GLBP request packets. (Optional) Displays a limited range of debugging output about GLBP packets. To display a limited range of debug messages about Gateway Load Balancing Protocol (GLBP) errors, events, and packets, use the debug glbp terse command in privileged EXEC mode. To disable debugging output, use the no form of this command. To configure an authentication string for the Gateway Load Balancing Protocol (GLBP), use the glbp authentication command in interface configuration mode. To delete an authentication string, use the no form of this command. Specifies an authentication string. The number of characters in the command plus the text string must not exceed 255 characters. No authentication of GLBP messages occurs. The authentication string is sent in plain text in all GLBP messages. The same authentication string must be configured on all the routers that are configured to be members of the same GLBP group, to ensure interoperation. A router will ignore all GLBP messages that contain the wrong authentication string. To configure a router to take over as active virtual forwarder (AVF) for a Gateway Load Balancing Protocol (GLBP) group if it has higher priority than the current AVF, use the glbp forwarder preempt command in interface configuration mode. To disable this feature, use the no form of this command. (Optional) Specifies a minimum number of seconds that the router will delay before taking over the role of AVF. The range is from 0 to 3600 seconds with a default delay of 30 seconds. Forwarder preemption is enabled with a default delay of 30 seconds. The following example shows a router being configured to preempt the current AVF when its priority is higher than that of the current AVF. If the router preempts the current AVF, it waits 60 seconds before taking over the role of the AVF. To activate the Gateway Load Balancing Protocol (GLBP), use the glbp ip command in interface configuration mode. To disable GLBP, use the no form of this command. (Optional) Virtual IP address for the GLBP group. The IP address must be in the same subnet as the interface IP address. (Optional) Indicates that the IP address is a secondary GLBP virtual address. GLBP is disabled by default. The glbp ip command activates GLBP on the configured interface. If an IP address is specified, that address is used as the designated virtual IP address for the GLBP group. If no IP address is specified, the designated address is learned from another router configured to be in the same GLBP group. For GLBP to elect an active virtual gateway (AVG), at least one router on the cable must have been configured with the designated address. A router must be configured with, or have learned, the virtual IP address of the GLBP group before assuming the role of a GLBP gateway or forwarder. Configuring the designated address on the AVG always overrides a designated address that is currently in use. When the glbp ip command is enabled on an interface, the handling of proxy Address Resolution Protocol (ARP) requests is changed (unless proxy ARP was disabled). ARP requests are sent by hosts to map an IP address to a MAC address. The GLBP gateway intercepts the ARP requests and replies to the ARP on behalf of the connected nodes. If a forwarder in the GLBP group is active, proxy ARP requests are answered using the MAC address of the first active forwarder in the group. If no forwarder is active, proxy ARP responses are suppressed. The following example activates GLBP for group 10 on Fast Ethernet interface 0/0. The virtual IP address to be used by the GLBP group is set to 10.21.8.10. The following example activates GLBP for group 10 on Fast Ethernet interface 0/0. The virtual IP address used by the GLBP group will be learned from another router configured to be in the same GLBP group. To specify the load-balancing method used by the active virtual gateway (AVG) of the Gateway Load Balancing Protocol (GLBP), use the glbp load-balancing command in interface configuration mode. To disable load balancing, use the no form of this command. (Optional) Specifies a load balancing method based on the MAC address of a host where the same forwarder is always used for a particular host while the number of GLBP group members remains unchanged. (Optional) Specifies a load balancing method where each virtual forwarder in turn is included in address resolution replies for the virtual IP address. This method is the default. (Optional) Specifies a load balancing method that is dependent on the weighting value advertised by the gateway. The round-robin method is the default. Use the host-dependent method of GLBP load balancing when you need each host to always use the same router. Use the weighted method of GLBP load balancing when you need unequal load balancing because routers in the GLBP group have different forwarding capacities. To configure the gateway to take over as active virtual gateway (AVG) for a Gateway Load Balancing Protocol (GLBP) group if it has higher priority than the current AVG, use the glbp preempt command in interface configuration mode. To disable this feature, use the no form of this command. (Optional) Specifies a minimum number of seconds that the router will delay before taking over the role of AVG. The range is from 0 to 3600 seconds with a default delay of 30 seconds. A GLBP router with a higher priority than the current AVG cannot assume the role of AVG. The following example shows a router being configured to preempt the current AVG when its priority of 254 is higher than that of the current AVG. If the router preempts the current AVG, it waits 60 seconds before assuming the role of AVG. Sets the priority level of the router within a GLBP group. To set the priority level of the gateway within a Gateway Load Balancing Protocol (GLBP) group, use the glbp priority command in interface configuration mode. To remove the priority level of the gateway, use the no form of this command. Priority of the gateway within the GLBP group. The range is from 1 to 255. The default is 100. 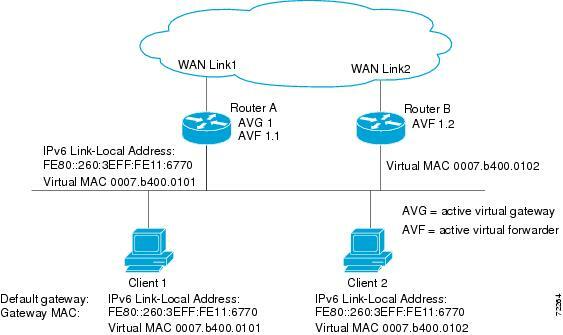 Use this command to control which virtual gateway becomes the active virtual gateway (AVG). After the priorities of several different virtual gateways are compared, the gateway with the numerically higher priority is elected as the AVG. If two virtual gateways have equal priority, the gateway with the higher IP address is selected. Configures a router to take over as the AVG for a GLBP group if it has higher priority than the current AVG. To configure the time between hello packets sent by the Gateway Load Balancing Protocol (GLBP) gateway and the time that the virtual gateway and virtual forwarder information is considered valid, use the glbp timers command in interface configuration mode. To restore the timers to their default values, use the no form of this command. (Optional) Specifies that the following (hellotime or holdtime) argument value will be expressed in milliseconds. Hello interval. The default is 3 seconds (3000 milliseconds). Time before the virtual gateway and virtual forwarder information contained in the hello packet is considered invalid. The default is 10 seconds (10,000 milliseconds). Routers on which timer values are not configured can learn timer values from the active virtual gateway (AVG). The timers configured on the AVG always override any other timer settings. All routers in a GLBP group should use the same timer values. If a GLBP gateway sends a hello message, the information should be considered valid for one holdtime. Normally, holdtime is greater than three times the value of hello time, (holdtime > 3 * hellotime). The range of values for holdtime force the holdtime to be greater than the hello time. To configure the time during which the active virtual gateway (AVG) for a Gateway Load Balancing Protocol (GLBP) group continues to redirect clients to a secondary active virtual forwarder (AVF), use the glbp timers redirect command in interface configuration mode. To restore the redirect timers to their default values, use the no form of this command. The redirect timer interval in the range from 0 to 3600 seconds. The default is 600 seconds (10 minutes). The time interval, in the range from 600 to 64,800 seconds, before the secondary virtual forwarder becomes unavailable. The default is 14,400 seconds (4 hours). A virtual forwarder that is assigned a virtual MAC address by the AVG is known as a primary virtual forwarder. If the virtual forwarder has learned the virtual MAC address from hello messages, it is referred to as a secondary virtual forwarder. The redirect timer sets the time delay between a forwarder failing on the network and the AVG assuming that the forwarder will not return. The virtual MAC address that the forwarder was responsible for replying to is still given out in Address Resolution Protocol (ARP) replies, but the forwarding task is handled by another router in the GLBP group. The timeout interval is the time delay between a forwarder failing on the network and the MAC address for which the forwarder was responsible becoming inactive on all of the routers in the GLBP group. After the timeout interval, packets sent to this virtual MAC address will be lost. The timeout interval must be long enough to allow all hosts to refresh their ARP cache entry that contained the virtual MAC address. To specify the initial weighting value of the Gateway Load Balancing Protocol (GLBP) gateway, use the glbp weighting command in interface configuration mode. To restore the default values, use the no form of this command. Maximum weighting value in the range from 1 to 254. Default value is 100. (Optional) Specifies a lower weighting value in the range from 1 to the specified maximum weighting value. Default value is 1. (Optional) Specifies an upper weighting value in the range from the lower weighting to the maximum weighting value. The default value is the specified maximum weighting value. The default gateway weighting value is 100 and the default lower weighting value is 1. The weighting value of a virtual gateway is a measure of the forwarding capacity of the gateway. If a tracked interface on the router fails, the weighting value of the router may fall from the maximum value to below the lower threshold, causing the router to give up its role as a virtual forwarder. When the weighting value of the router rises above the upper threshold, the router can resume its active virtual forwarder role. Use the glbp weighting track and track commands to configure parameters for an interface to be tracked. If an interface on a router goes down, the weighting for the router can be reduced by a specified value. To specify a tracking object where the Gateway Load Balancing Protocol (GLBP) weighting changes based on the availability of the object being tracked, use the glbp weighting track command in interface configuration mode. To remove the tracking, use the no form of this command. Object number representing an item to be tracked. Use the track command to configure the tracked object. (Optional) Specifies an amount by which the GLBP weighting for the router is decremented (or incremented) when the interface goes down (or comes back up). The value range is from 1 to 254, with a default value of 10. The default decrement value is 10. This command ties the weighting of the GLBP gateway to the availability of its interfaces. It is useful for tracking interfaces that are not configured for GLBP. When a tracked interface goes down, the GLBP gateway weighting decreases by 10. If an interface is not tracked, its state changes do not affect the GLBP gateway weighting. For each GLBP group, you can configure a separate list of interfaces to be tracked. The optional value argument specifies by how much to decrement the GLBP gateway weighting when a tracked interface goes down. When the tracked interface comes back up, the weighting is incremented by the same amount. When multiple tracked interfaces are down, the configured weighting decrements are cumulative. Use the track command to configure each interface to be tracked. In the following example, Fast Ethernet interface 0/0 tracks two interfaces represented by the numbers 1 and 2. If interface 1 goes down, the GLBP gateway weighting decreases by the default value of 10. If interface 2 goes down, the GLBP gateway weighting decreases by 5. Specifies the initial weighting value of a GLBP gateway. To display Gateway Load Balancing Protocol (GLBP) information, use the show glbp command in privileged EXEC mode. (Optional) Interface type and number for which output is displayed. (Optional) GLBP group number in the range from 0 to 1023. (Optional) State of the GLBP router, one of the following: active, disabled, init, listen, speak, or standby. (Optional) Summarizes each virtual gateway or virtual forwarder with a single line of output. Use the show glbp command to display information about GLBP groups on a router. The brief keyword displays a single line of information about each virtual gateway or virtual forwarder. Table 1 describes the significant fields shown in the displays. Interface type and number and GLBP group number for the interface. • Disabled—Indicates that the virtual IP address has not been configured or learned yet, but other GLBP configuration exists. • Initial—The virtual IP address has been configured or learned but virtual gateway configuration is not complete. An interface must be up and configured to route IP, and an interface IP address must be configured. • Listen—Virtual gateway is receiving hello packets and is ready to change to the "speak" state if the active or standby virtual gateway becomes unavailable. • Speak—Virtual gateway is attempting to become the active or standby virtual gateway. • Standby—Indicates that the gateway is next in line to be the active virtual gateway (AVG). • Active—Indicates that this gateway is the AVG, and that it is responsible for responding to Address Resolution Protocol (ARP) requests for the virtual IP address. • Disabled—Indicates that the virtual MAC address has not been assigned or learned. This is a transitory state because a virtual forwarder changing to a disabled state is deleted. • Initial—The virtual MAC address is known but virtual forwarder configuration is not complete. An interface must be up and configured to route IP, an interface IP address must be configured, and the virtual IP address must be known. • Listen—Virtual forwarder is receiving hello packets and is ready to change to the "active" state if the active virtual forwarder (AVF) becomes unavailable. • Active—Indicates that this gateway is the AVF, and that it is responsible for forwarding packets sent to the virtual forwarder MAC address. The virtual IP address of the GLBP group. All secondary virtual IP addresses are listed on separate lines. If one of the virtual IP addresses is a duplicate of an address configured for another device, it will be marked as "duplicate." A duplicate address indicates that the router has failed to defend its ARP cache entry. The hello time is the time between hello packets (in seconds or milliseconds). The holdtime is the time (in seconds) before other routers declare the active router to be down. All routers in a GLBP group use the hello and holdtime values of the current AVG. If the locally configured values are different, the configured values appear in parentheses after the hello time and holdtime values. Time until GLBP will send the next hello packet (in seconds or milliseconds). Indicates whether GLBP gateway preemption is enabled. If enabled, the minimum delay is the time (in seconds) a higher-priority nonactive router will wait before preempting the lower-priority active router. This field is also displayed under the forwarder section where it indicates GLBP forwarder preemption. Value can be "local," "unknown," or an IP address. Address (and the expiration date of the address) of the current AVG. This field is also displayed under the forwarder section where it indicates the address of the current AVF. Value can be "local," "unknown," or an IP address. Address (and the expiration date of the address) of the standby gateway (the gateway that is next in line to be the AVG). Initial weighting value with lower and upper threshold values. List of objects that are being tracked and their corresponding states. Configures the time between hello messages and the time before other routers declare the active GLBP router to be down. To configure an interface to be tracked where the Gateway Load Balancing Protocol (GLBP) weighting changes based on the state of the interface, use the track command in global configuration mode. To remove the tracking, use the no form of this command. Object number in the range from 1 to 500 representing the interface to be tracked. Tracks the specified interface type and number. Tracks whether the interface is up. Tracks whether IP routing is enabled, an IP address is configured on the interface, and the interface state is up, before reporting to GLBP that the interface is up. The state of the interfaces is not tracked. Use the track command in conjunction with the glbp weighting and glbp weighting track commands to configure parameters for an interface to be tracked. If a tracked interface on a GLBP router goes down, the weighting for that router is reduced. If the weighting falls below a specified minimum, the router will lose its ability to act as an active GLBP virtual forwarder. In the following example, Fast Ethernet interface 0/0 tracks whether serial interfaces 2/0 and 3/0 are up. If either serial interface goes down, the GLBP weighting is reduced by the default value of 10. If both serial interfaces go down, the GLBP weighting will fall below the lower threshold and the router will no longer be an active forwarder. To resume its role as an active forwarder, the router must have both tracked interfaces back up, and the weighting must rise above the upper threshold. In the following example, Fast Ethernet interface 0/0 tracks whether serial interface 2/0 is enabled for IP routing, whether it is configured with an IP address, and whether the state of the interface is up. If serial interface 2/0 goes down, the GLBP weighting is reduced by a value of 20. AVF—active virtual forwarder. One virtual forwarder within a GLBP group is elected as active virtual forwarder for a specified virtual MAC address, and is responsible for forwarding packets sent to that MAC address. Multiple active virtual forwarders can exist for each GLBP group. AVG—active virtual gateway. One virtual gateway within a GLBP group is elected as the active virtual gateway, and is responsible for the operation of the protocol. GLBP gateway—Gateway Load Balancing Protocol gateway. A router or gateway running GLBP. Each GLBP gateway may participate in one or more GLBP groups. GLBP group—Gateway Load Balancing Protocol group. One or more GLBP gateways configured with the same GLBP group number on connected Ethernet interfaces. vIP—virtual IP address. An IPv4 address. There must be only one virtual IP address for each configured GLBP group. The virtual IP address must be configured on at least one GLBP group member. Other GLBP group members can learn the virtual IP address from hello messages. Note	 Refer to the Internetworking Terms and Acronyms for terms not included in this glossary.